Please join the Woman’s Art Association of Hamilton at a wonderful fundraising event, A Night for Art: The Capolongo Purchase. 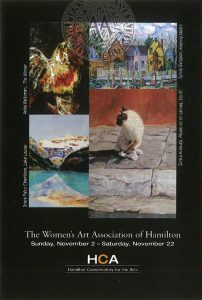 The WAAH has played a pivotal role in Hamilton’s artistic heritage for 114 years. Join us as we continue this tradition by purchasing an original painting by local artist Bruno Capolongo for the Permanent Collection at the Art Gallery to Hamilton.